Excellent hotel. I was specifically impressed by the staff! So nice people. Nice views of the forest. Japanese breakfast option not of our taste but still good. Very nice and clean property. Excellent value for location and quality. The breakfast set up with individual ceramic table grills was very unique and enjoyable. The room was spacious with a porch. Close to center of town. Transportation to the train station was quick and easy. 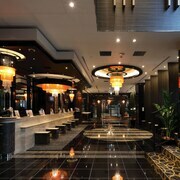 Excelent location and large rooms with tea tables. The dinner ceremony is quite unique and an experience on its own. Short walk to the water Torii and Shrine. Navette dispo en appelant au point d'info de la gare maritime en 10mn. Parfait. Hotel au calme mais proche des points d'attraction, chambre et petit dejeuner typiquement japonais. Charme un peu désuet. Acceuil et conseils supers! 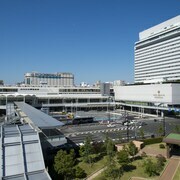 The location of the hotel is very close to the shopping area and the shrine. Could use some updating and renovation but the friendly staff and the food were both excellent. Great location for the peace memorial park but a fairly basic hotel. Clean and functional with friendly staff. Situated in Hatsukaichi, this ryokan is within a 5-minute walk of Five-Story Pagoda and Itsukushima Shrine. Miyajima Ferry Terminal is 0.6 mi (0.9 km) away. The room was adequate. small and compact. I won't say any more than that.